I was introduced to Richard Feynman by my friend and frequent collaborator Mark. Richard Feynman was a physicist and one of the finest minds that ever existed, he taught me so much about critical thinking. He is probably only secondary to Gregory Bateson in that respect. “Now I’m going to discuss how we would look for a new law. In general, we look for a new law by the following process. First, we guess it (audience laughter), no, don’t laugh, that’s the truth. Then we compute the consequences of the guess, to see what, if this is right, if this law we guess is right, to see what it would imply and then we compare the computation results to nature or we say compare to experiment or experience, compare it directly with observations to see if it works. Much like the first step in our perception of reality (and therefore what reality it is to us) is based on a best guess. We most commonly experience this “best guessing” when we see faces or shapes in clouds. It is so common, it even has a name; Pareidolia. We also see patterns in random data (Apophenia. To learn more about this, I highly recommend Fooled By Randomness by Nassim Taleb), mis-recalling events (Confabulation) and hearing different words in song lyrics (a Mondegreen). But it also occurs when we are decided (often unconsciously) how to act and behaviour. We make a best guess based on prior experiences, observing and mimicking other people, imagination and so on. Sometimes this guess works, sometimes it doesn’t, but what we rarely do is actually test it. We just repeat it over and over again. It is important to start testing these behavioural “guesses” consciously, to compare to experimental or experiential results and check we are doing the right thing. If we are not, we need to develop behaviour flexibility to do something else (and then test that!). 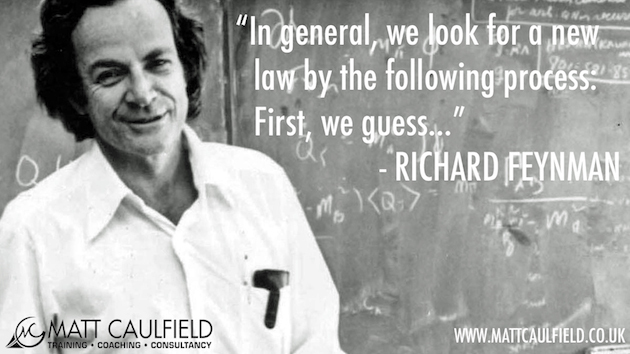 Our behaviour needs to be more like how Richard Feynman describes the a development of a new law, a constant process of guessing, testing and adjusting.